Alien Explorations: Alien Covenant: Traces of "Before The Watchman: Ozymandias"? Alien Covenant: Traces of "Before The Watchman: Ozymandias"? a) On the 20th of September 2017, name Jae came through, might as well have been another one of these messages from across the galaxy, never heard of him. 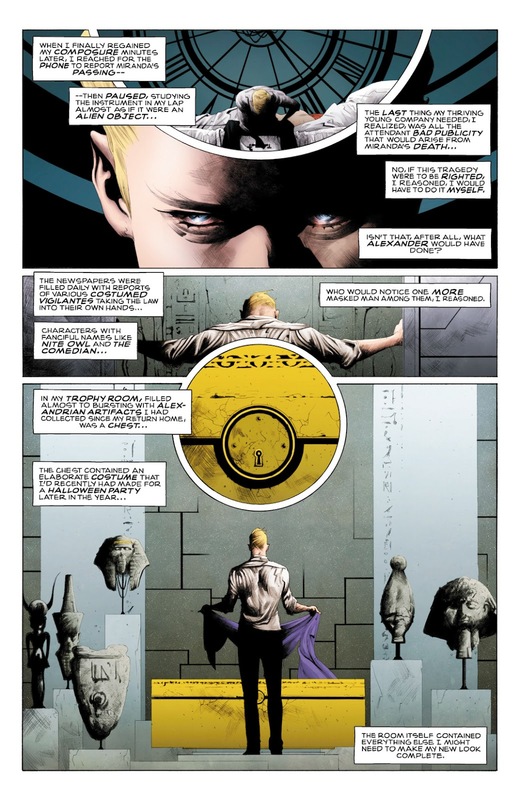 Ozymandias as a boy before the bust of Alexander The Great in "Before The Watchman: Ozymandias"
b) But looking up the name, there's an artist Jae Lee who illustrated a Before The Watchmen comic book story about the character Ozymandias from The Watchmen (which isn't a comic book series I'm interested in) looking back over his life to where he was now, and perhaps there are similarities between him and the character David who was waffling Ozymandias lines in the Alien Covenant film. 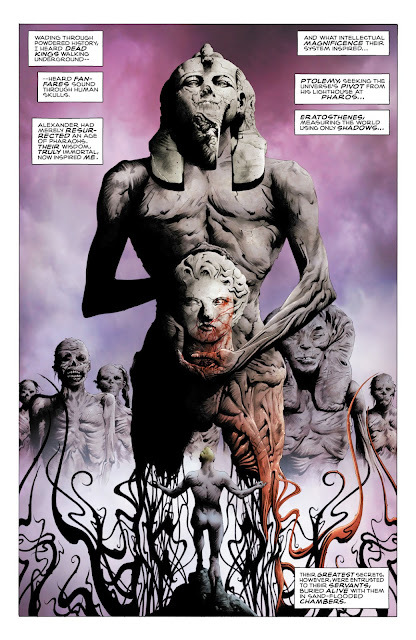 Ozymandias resurrecting the long dead bearers of ancient secrets "Before The Watchman: Ozymandias"
c) While David is obsessed about Lawrence of Arabia, the man who becomes the superhero Ozymandias is obsessed with following in the footsteps of Alexander The Great. Both characters are hyper intelligent and involved in resurrecting ancient knowledge. Ozymandias' trophy room from "Before The Watchman: Ozymandias"
d) The Ozymandias story features scenes with the character amongst ancient giant statues and head sculptures in museum scenes etc, while David found himself living in a city full of giant head sculptures. 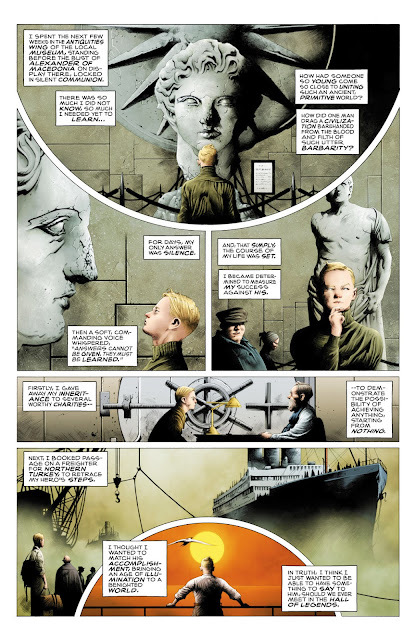 Meanwhile the original poem Ozymandias by Shelley speaks about a traveller who speaks of a giant broken statue in the desert, so there isn't much wonder that the character should be connected with statues, but perhaps the comic book story helped to bind ideas together. 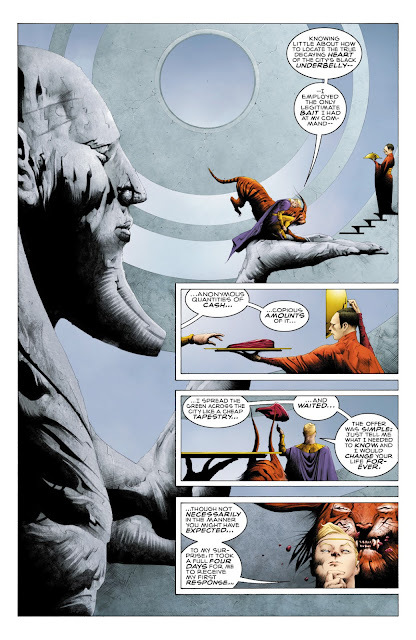 Ozymandias and his pet cat on hand of giant statue from "Before The Watchman: Ozymandias"